Chiropractors have a role to play in their patient’s general well being and self care. One way that chiropractors do this is through maintenance care. Most people associate a visit to the chiropractor with injuries like whiplash, thrown backs and other kinds of pain that require immediate treatment. That is only one part of a much bigger picture. The goal of maintenance care is to maintain optimal function and movement, keep your body balanced and to prevent future injuries. Based out of the Brentwood Chiropractic Clinic in Sherwood Park, Dr. Cooksley regularly sees patients of all ages for acute and maintenance treatment. The end goal of maintenance care and self care is the same: to ensure you are healthy. Maintenance care focuses your physical well being, which is one part of the bigger picture of your health. “Good self care and health is a balance between looking after your physical health, as well as your emotional health and mental health.” Says Dr. Cooksley. It isn’t hard to incorporate self care into your day. Maintenance care, getting restful sleep and eating well are just a few ways to keep you at your best. Dr. Cooksley maintains her own self care in a number of ways. A maintenance and injury prevention-style treatment plan is unique to each patient, just like self care. After an assessment, chiropractors work with their patients to set health goals and make recommendations on treatments. Often, patients are able to fulfill these recommendations independently. “We are here to support you when you want to change your activities or lifestyle and need new tools to get you to your goals.” Explains Dr. Cooksley. Maintenance care can include teaching patients stretches, helping to monitor existing physical conditions, nutritional counselling and providing advice to empower patients. How do I know if chiropractic is a good choice for me? It’s important to keep in mind that self care requires different tools to successfully support your health. 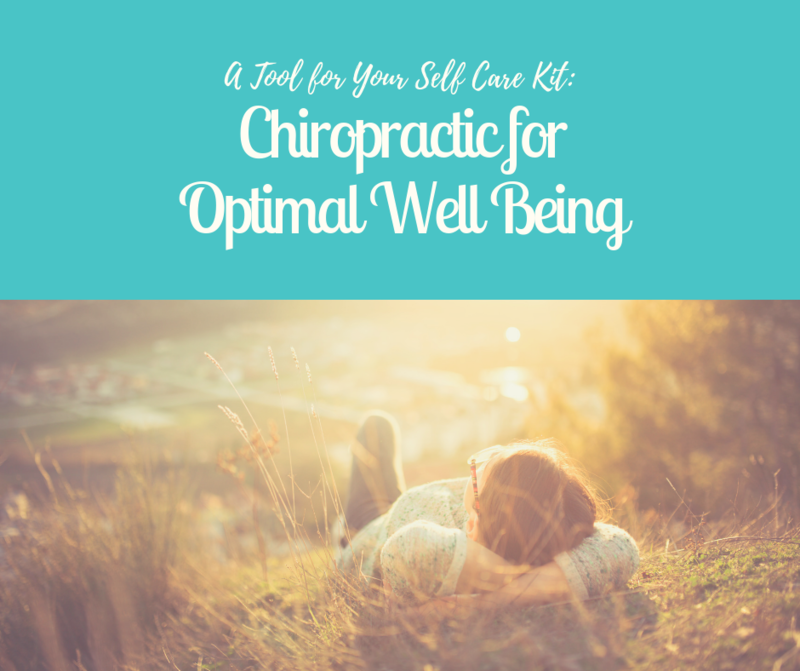 Chiropractic is a great way to keep your body flexible and relieve pain, and it fits well with other kinds of self care activities. The best way to determine whether chiropractic care is for you is by having a conversation with a chiropractor. Depending on your needs, your chiropractor may work with another health care professional, or refer you for a different kind of treatment. “Seek out health-care professionals that are dedicated to helping you live a healthier, happier life. That may be a chiropractor, and it may be massage therapists, acupuncturists, nutritional counsellors and physiotherapists,” Suggests Dr. Cooksley. Maintenance care can help prevent pain and keep your joints functioning to the best of their ability but injuries can still happen. If your pain is persistent, seek advice from a chiropractor.